Home › Sociology › gender & feminism › Down Under Feminists Carnival: Second Edition! Down Under Feminists Carnival: Second Edition! 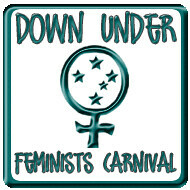 I am chuffed to announce that the Second Edition of the Down Under Feminists Carnival is now up at In A Strange Land! Lots of weekend reading for you there: check it out. And please post a pointer to it on your blog, especially if you have a post there! Now is the time to start submitting any of your July posts to the next carnival, which is to be kindly hosted at Audrey and the Bad Apples on 5th August or thereabouts. If there are any volunteers for the Sixth edition, or for 2009 carnivals, please drop me a line by email. Please read the carnival details before volunteering.